I've mentioned in the past my obsession for scents and perfume and since then, not only my passion has grown but I've also become much more interested with the components of a perfume (top notes, base layer, etc...). The newest addition to my collection is sadly not Byredo's Mojave Ghost (one day… one day), but it is still a pretty good contender for one of the best perfumes I've ever smelled. It is Maison Louis Marie's No. 4 Bois de Balincourt. If you follow fashion and beauty bloggers, chances are, you would have heard about it. 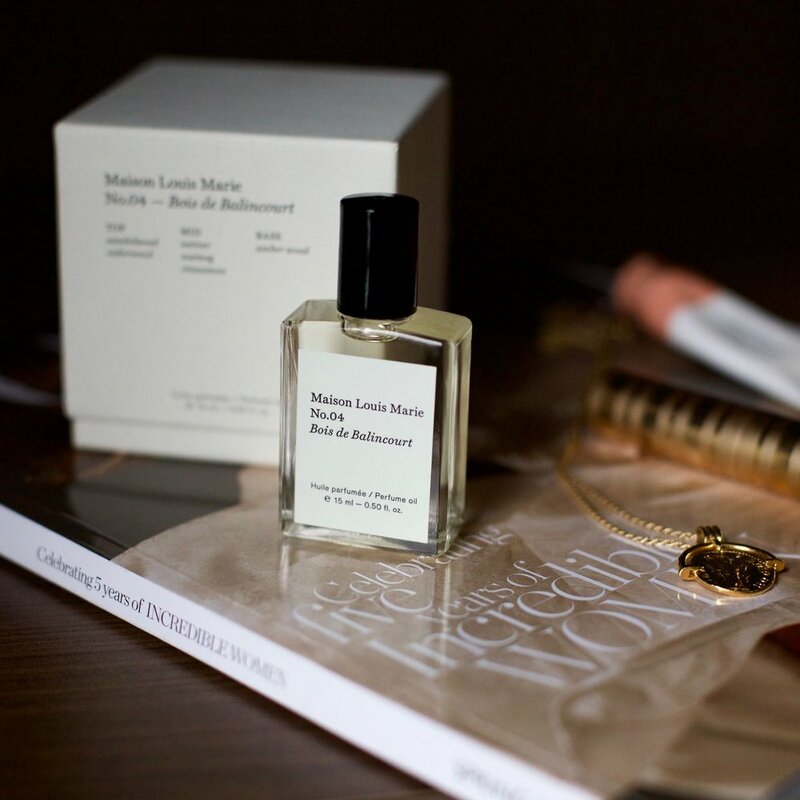 Maison Louis Marie is not a 'mainstream brand', but this perfume is well known within the community of beauty fanatics. I first saw it on Gel Cream's Instagram, but Brittany Bathgate has also talked about it on the 'On the Line' podcast. The first time I smelled it, my thoughts were that Dyptique Philosykos and Le Labo Santal 33 had a love child. It’s a warm and woody scent that smells even better once it is on the skin. It's honestly quite a modern and dreamy smell! It is a perfume oil so it lasts way longer on the skin than sprays, and you need much less (yay for an endless bottle). The top notes are sandalwood and cedar wood, the mid notes are vetiver, nutmeg and cinnamon and finally the base note is amber wood. The bottle is very small and as far as I know, this is the only size available, and as I’ve said, you don’t need a lot of product. It's perfect for traveling or to carry in your bag for touch-ups at the end of the day. I also am completely smitten with the minimalist packaging, it looks so good on a dressing table. It also shows that less is more!